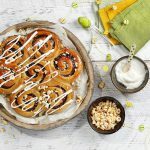 These sweet vegan sticky date buns are perfectly spiced with a delicious flavour of cinnamon that pairs perfectly with the creamy cheese frosting. Melt the coconut butter and add the milk and dry yeast, stirring to combine. In another bowl combine, flour, salt and sugar, add the wet ingredients and mix for about 5 minutes until a soft dough forms. Remove the dough from the mixer and continue kneading with your hands for a few more minutes. Place the dough back in the bowl and cover with cling film, let the dough rest and double in size for 1 hour in a warm place. Once the dough has risen, preheat the oven to 180°C. For the date caramel sauce add dates in a small pot over medium heat with 80 ml of water. Stir until the dates have completely melted. Add the cinnamon and set aside to cool. Roll your dough out onto a floured surface into a rectangle. Spread with date caramel. Roll up the dough and cut into 7 parts, about 3-4 cm long each. Brush a cake tin with coconut oil and place the buns inside, cut side facing up. Brush the top with some oat milk. Bake for 25 minutes. When ready, brush with maple syrup. For the creamy frosting, mix the Violife creamy original and the maple syrup together. 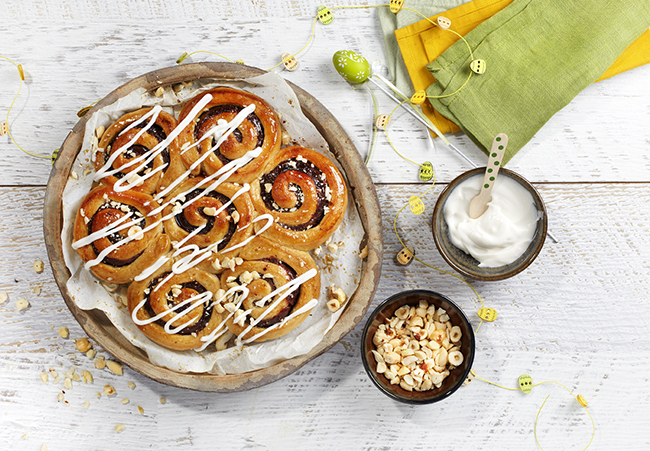 Just before serving, spread the creamy frosting on top of your buns and then add some nuts on top.